Yea, they need to give back. Walmart is this week raising its min wage. I guess working on the line at Ford, GM or Chrysler will always pay more than serving food. TIM HORTONS LOOK AT YOUR PLACE IN HISTORY. 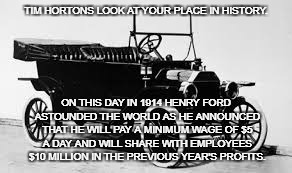 ON THIS DAY IN 1914 HENRY FORD ASTOUNDED THE WORLD AS HE ANNOUNCED THAT HE WILL PAY A MINIMUM WAGE OF $5 A DAY AND WILL SHARE WITH EMPLOYEES $10 MILLION IN THE PREVIOUS YEAR'S PROFITS.